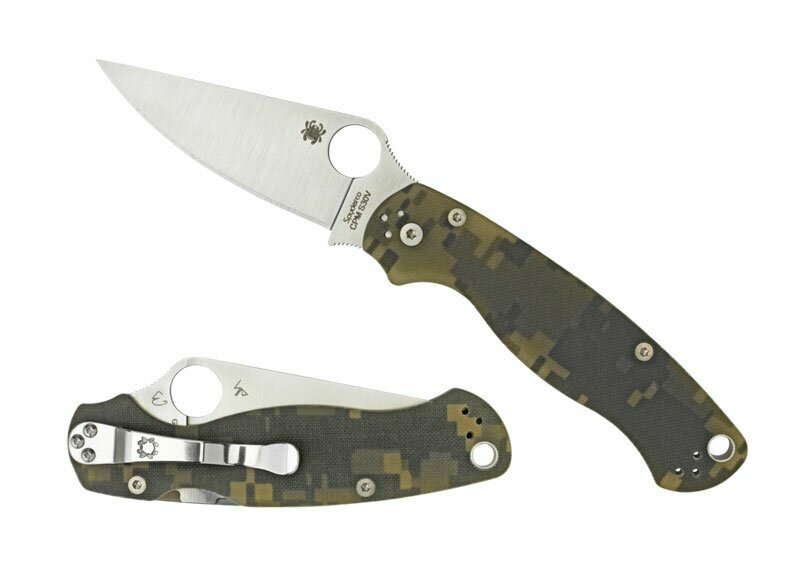 Spyderco Para Military 2 G-10 Plain Edge Camo(C81GPCMO2) High quality Spyderco knives, folding knives, tactical knives. Our 2010 Para-Military2 Digital Camouflagehas several changes over the classic version. The G-10 handle is narrowed at the end improving the ergonomics. The handle and blade have been profiled thinner; removing uncomfortable angles when in the closed position. It features a Compression Lock and an ambidextrous-friendly four way clip which carries tip-up/tip-down, left/right-hand and rests deeper in a pocket. We kept the same high-performance CPM-S30V full flat-ground blade but we’ve also lengthened the blade’s tip and added additional surface jimping to both the spine and finger choil. Implementation of a new Bushing Pivot System generates fluid action and more consistent manufacturing tolerances. Larger lanyard gives more options for carry. Refinements to overall construction may not be drastic or even visible to the eye but from the G-10 textured handle to the CPM-S30V steel full flat blade, everything is sharper, smoother and guaranteed to provide performance and user comfort.